Ok, we are very behind on the band wagon on this one but I'm pretty sure this is a case of being better late than never. 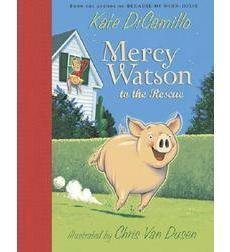 Last year the character of Mercy Watson turned 10 years old. I was invited to review this lovely series of books written by Kate DiCamillo. Having never read them before, and having a burgeoning reader in Bookworm2 (age 6 1/2), I thought we should probably give these a whirl. While Bookworm1 (age 9) is a voracious reader and quite advanced for his age, Bookworm2 is a little bit more reticent. He wants to read but it's harder for him to learn than it was his older brother. As you know, what works for one child doesn't always work for another and I'd been a bit desperate to find a set of chapter books which would make for more easy reading for my second born. People have suggested graphic novels but I'm personally adverse to them (because I'm a snob, ok?). If I can go on avoiding graphic novels, I will. I liked the looks of Mercy Watson though because the story is streamlined and complete without the flash and dash which I find distracting(-to-unappealing) in graphic novels. Yet still, there are plenty of full colored illustrations in the Mercy Watson books to give them that picture book feel and quality which provides a nice bridge between picture and chapter books. The first two titles in the Mercy Watson books arrived and Bookworm2 and I sat down to give Mercy Watson to the Rescue a go. 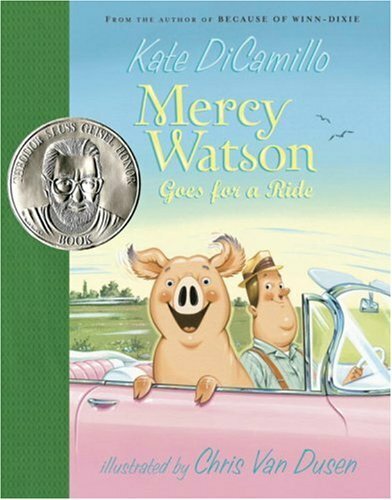 In case you are unfamiliar with this character you should know that Mercy Watson is a pig who is in love with buttered toast. Mercy is sort of oblivious to the goings on of the rest of the world. She lives for pleasure and the received love of her people. Mercy lives with Mr. and Mrs. Watson who considered Mercy to be their "baby." They pamper and spoil Mercy and fill her up with all the buttered toast that her little piggy heart could desire. One night, the Watsons are all asleep in their bed on the second floor of their home, dreaming pleasant dreams. Suddenly, they are awoken by a loud crack which is the floor giving way. The bed becomes to crash through the floor and the ceiling below. None of the Watsons are sure what the noise was but the awakened Mercy heads towards the kitchen in search of toast. Misadventures lead to misadventures and we meet the elderly Lincoln sisters who live next door, as well as the town firemen. Ultimately, Mercy is credited with having saved the Watsons from their bed troubles and everyone enjoys a midnight snack of buttered toast. All's well that end's well. We finished up our read in high spirits. Bookworm1 was as proud as punch to have read his first full chapter book completely by himself. I, as his mother, was probably more excited than he was. We both loved Mercy Watson to the Rescue , although perhaps for slightly different reasons. I loved it because the font size was large, the book is divided into chapters, there are wonderful illustrations throughout, and an actual story of merit was told. There were interesting characters and funny happenings which kept us wondering what was going to happen next. Bookworm2, who has been saying that he wants to read chapter books like his brother, was happy because he finally found a book that allowed him that privilege. Truly, I couldn't be more pleased with this series. The day after we finished Mercy Watson to the Rescue we continued on with Mercy Watson Goes for a Ride . The charm and the fun continue we find the Watsons enjoying a quiet Saturday morning. Mr. Watson decides to head out for a drive in his pink convertible and Mercy is invited to go for a ride. By all appearances it sounds like it's going to be a calm and pleasant day but that's before Baby Lincoln, one of the elderly ladies who live next door to the Watson, is found hiding out in the backseat of the convertible. It seems as if she is looking for a little excitement in her life and excitement is just what all of the occupants of the vehicle end up finding. It's a cute story and very much in keeping with the first book in the series. By the time we finished the second book I was completely sold on Mercy Watson. I ordered the third book for Bookworm2 to read and he polished that one off as well. We were sent an additional title or two in the series for review and I'll come back in a few weeks and tell you more about them. We read the first three straight through so quickly that I've held the last three titles back until Bookworm2's birthday which is coming up here shortly. He asked me if there were more Mercy Watson books and I was happy to say, "YES!" I just figured we should space out our books and so for a short time, the last three books in the series have been hiding out in my bedroom closet. If you have a reluctant reader and you yourself are reluctant about the graphic novels being too hastily recommended to you, take heart! You do not have to go that route if you don't want to! Mercy is a perfect character to start any reader off with, but especially one who needs a little extra help launching from picture to chapter books. I love that Candlewick published these books with the look and feel of a chapter book. It has honestly been a true delight to see Bookworm2 take pride in the fact that he has a chapter book series that belong to him and that he can read. It does both my mother and reading heart good, I tell you what! I've already stair stepped him over to another series now that he has some confidence in his ability to read harder words and longer stories. But we'll back track to Mercy who is now a very beloved pig in our household. Many, many, many thanks to Candlewick Press for publishing Mercy Watson books and sending us a few titles to check out for review purposes. Extra special congratulations to Kate DiCamillo, Candlewick and, of course, the Porcine Wonder, on celebrating 10 years! A Belated Happy Birthday to Mercy! Although I did receive a copy of the first two titles in order to facilitate a review, please rest assured that my opinions are 150% my very own. I received no additional compensation for this post. Our #2 loves these, too. I think they are rather brilliant and especially funny. They're beyond the Frog and Toad...and a real chapter book. Kate DiCamillo's varied writing is rather awesome. :) Have you tried Cynthia Rylant yet with Bookworm 2? My boys love these books! The audio book versions are fun, too. Kate DiCamillo has delightful books. And I support your opinion of the graphic novel. Down with the graphic novel!